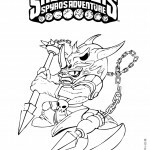 Welcome to our Skylanders coloring pages. There are 32 standard characters, and 8 different elements Earth under which characters are classified. When the characters are placed on the “Portal of Power”, they appear in the game. 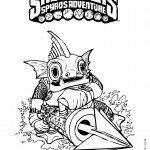 The “Starter Pack” has three character to start with – Spyro, Trigger Happy, and Gill Grunt. Each character has specialized statistics in areas such as luck, strength, agility, defense, health, speed, armor, and critical hit. The player can also find hats for the characters, which further affect statistics. 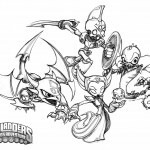 In addition to the standard character figures that are available for purchase there are also limited edition Gold (Flameslinger, Drill Sargent, and Boomer), Silver (Eruptor, Dino-Rang, and Boomer), Crystal (Stealth Elf, Cnyder, and Wham-Shell), and Glow-in-the-Dark (Warnado, Zap, Wrecking Ball) versions of certain characters. 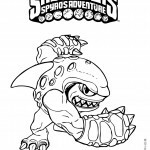 Also, Bash has a Clear Blue version that was a Toys-R-Us exclusive. 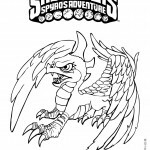 Cynder has a Metallic Purple version and was only available at the 2012 New York Toy Fair. Hex has a Pearl White version and was only available at the 2012 Nuremberg Toy Fair. 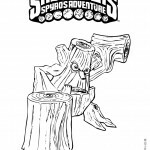 Stump Smash has a Flocked version and was only available as part of a frito-lay promotion. 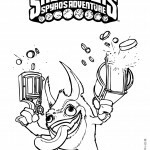 Spyro, Bash, Chop Chop, and Trigger Happy also have “legendary” versions that are part of a Toys-R-Us exclusive. 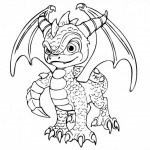 Spyro also has a “dark” version included with the 3DS copy of the game. The legendary versions are repainted as Blue/Gold and have different stats. 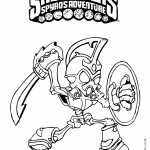 Dark Spyro also has different stats than Spyro and has a Dark Navy/Silver color scheme. 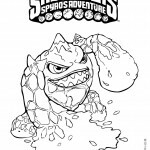 But now you can decide what color they need to be with these Skylanders coloring pages. 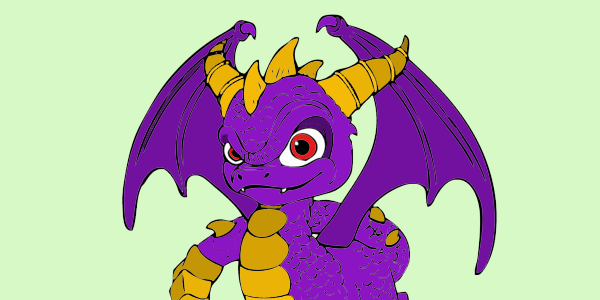 So show the world which colors you think the characters should be.